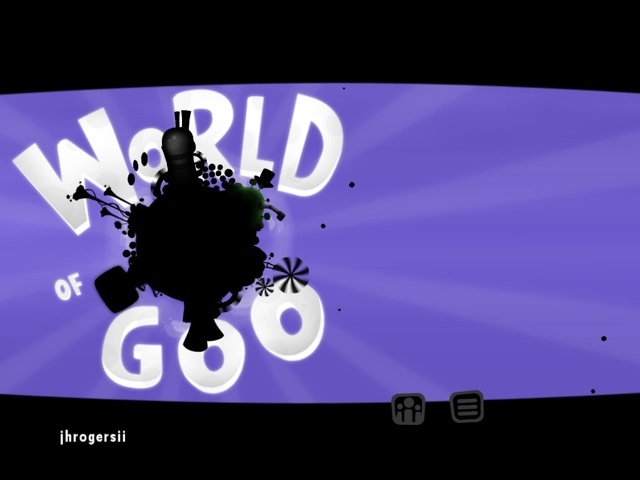 If you have a Wii like I do, or if you are a frequent purveyor of PC puzzle games, you might already be familiar with 2D Boy’s underdog hit World of Goo. If so, you are probably aware of all the accolades that it has racked up over the three years since its original release on the Wii. Looking at the “All-Time Top iPhone Apps” charts Apple updated earlier today, I noticed two interesting numbers worth to be shared: Apple is listing the actual number of free and paid iPhone apps available in the App Store. There are 306,554 iPhone apps available, and 201,635 of them are paid apps. These numbers are noteworthy as Apple rarely provides official stats of the iPhone App Store: they announced the 300,000 apps milestone on November 22 with the release of iOS 4.2 but there never was an easy way to instantly check on the exact number of apps available in the Store. 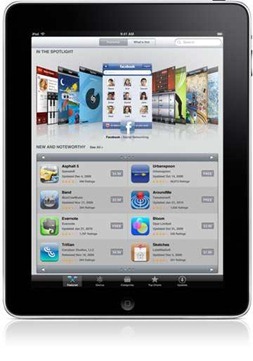 Their post also mentions that there are just under 60,000 ‘native’ iPad apps in the store. I’m assuming that number includes universal apps, design for iPhone, iPad, and iPod Touch. According to MacStories’ numbers, iPad apps are on track to hit 100,000 just a little quicker than iPhone apps did (in 14 months rather than 15). Flipboard is a fast, beautiful way to flip through the news, photos and updates your friends are sharing on Facebook and Twitter. See your social media in a magazine layout that is easy to scan and fun to read. Share articles and photos, comment on posts, and like or favorite anything. 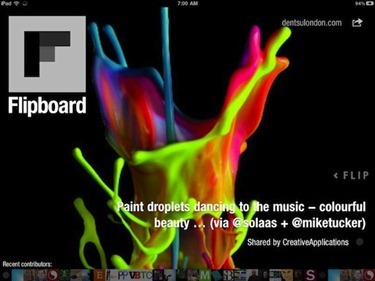 Customize your Flipboard with sections created from your favorite people, lists and blogs on Twitter. I’ve been using the app since it launched and like it a lot, it’s an everyday read for me. You can find Flipboard in the App Store now, and it’s a free app. Best App Store Policy Statement. Ever. Apple’s newly published guidelines for the App Store review process provide a candid, plainly written summary of the company’s policies on iOS software, including the blunt statement in the introduction: "We don’t need anymore Fart apps." 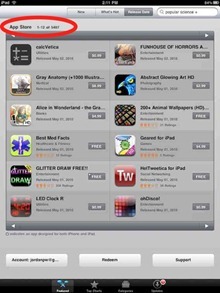 The App Store for the iPad and the iPhone has added several new featured sections, to aid in app discovery. I’m not sure exactly how new these are, but I’ve only just noticed them today – and I think they’re a very nice addition for the App Store. The new sections include Newsstand, shown above, which showcases some of the leading newspaper, magazine, RSS reader and general news apps available for the iPad and iPhone. It’s a great section if you’re a news and reading apps junkie like I am. 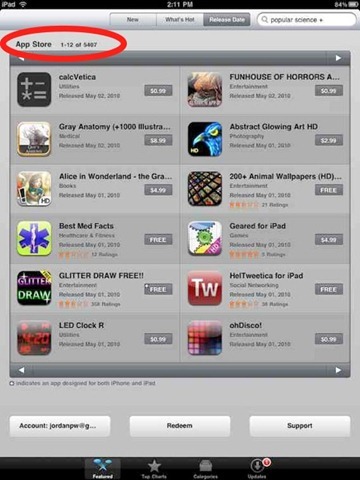 So there are now a little over 5,400 iPad apps in the App Store, as of around 10 minutes ago. 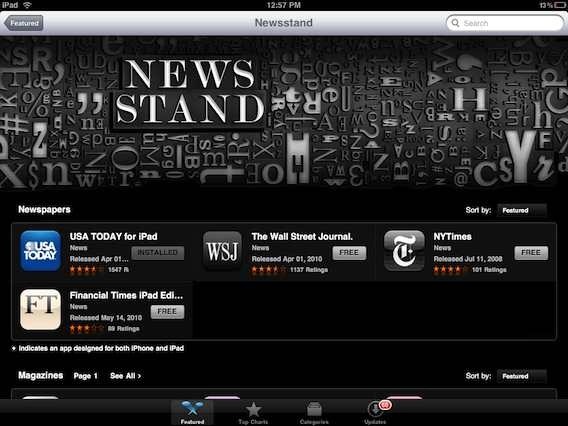 And there is now an easy way to keep up with how many iPad apps there are, right in the App Store on the iPad itself. If you go to the Featured section of the App Store and press to go to the Release Date tab, it shows you that you are currently seeing, for instance, apps 1-12 of 5,407 – as shown in the screencap above. Ah, the satisfaction that can be obtained just from the addition of a simple button and filter. The iTunes App Store has just added just such a button. The cute little toggle shown above, that lets you filter your view and see only iPad or iPhone apps while perusing the store. 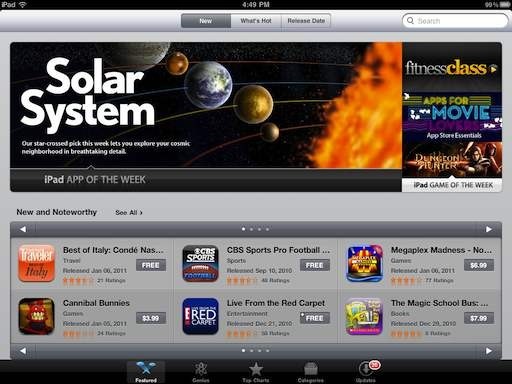 This was one of my first complaints in rounding up my first impressions of the iPad App Store – as previously you would select to view iPad apps, look at an individual app’s details, and find when you returned to the parent section (Featured or What’s Hot or wherever) you were back to viewing all iPhone and iPad apps. Nice to see Apple has provided this filtering feature so quickly. Apple has begun putting together the iPad-specific App Store in anticipation of the upcoming iPad launch. 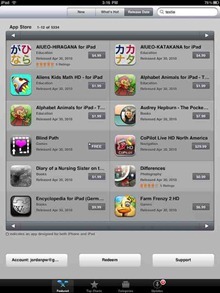 iPad-only Apps have begun to be approved and organized. 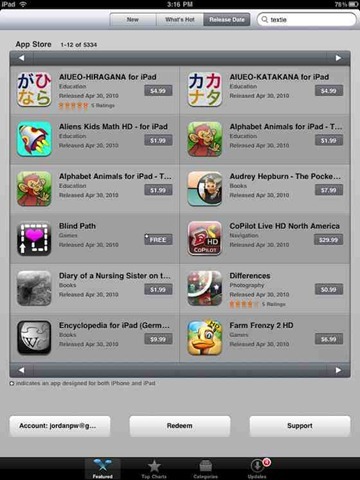 MacRumors has managed to access the iPad’s best seller lists which reveal several of the iPad App Store launch titles. The lists show several dozen applications with release dates as far back as March 19th. The fact that the iPad-specific applications are ranked suggests that the applications are being downloaded/purchased at least on a limited basis, despite the lack of iPad availability for the general public. A report yesterday indicated that a number of these iPad-specific applications had temporarily appeared in Apple’s web-based ‘iTunes Preview’ App Store listing. That’s from a MacRumors report earlier today. 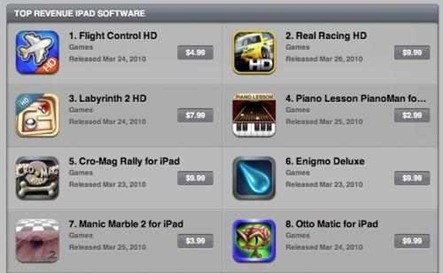 Some very familiar names on that list – in fact at least a couple that I’m pretty sure were present in the Day 1 iPhone App Store and now look to be early leaders in the Day 1 iPad App Store.